Joined by Nancy Lieberman, Jason Witten, Greg Swindell and more, Connolly Brinker will be represented by her family at the annual induction banquet on March 30. WACO, Texas (March 26, 2019)—1950s Tennis star Maureen Connolly Brinker will join a long list of Texas legends in the Texas Sports Hall of Fame as a part of the Class of 2019. Connolly Brinker, nicknamed “Little Mo,” began her legendary career as a 10-year-old in San Diego, California in 1944. She became the youngest winner of Southern California’s 18 and under Division Championship in 1948 at just the age of 14. By 16, she was ranked as the number one junior girl by the United States Lawn Tennis Association, now known as USTA. In 1951, Connolly Brinker became the youngest player to ever win the prestigious U.S. National Championship, now known as the US Open, before the age of 17. She defended her US titles in 1952 and continued her legacy, winning the Wimbledon Championship. The next year, she won 14 titles, including all four of the majors in one calendar year, achieving the elusive Grand Slam- winning the Australian, French, Wimbledon and U.S. Open. She was the first woman and second player in history to accomplish this title. 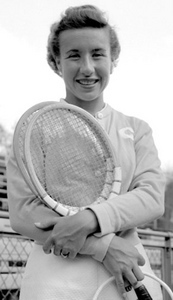 In 1954, Connolly Brinker won both the Wimbledon and the French Open. She won the Wightman Cup for four straight years from 1951-1954, winning all seven of her singles matches. The Associated Press named her “Female Athlete of the Year” for three consecutive years, from 1951-1953. She was ranked in the top 10 in the world from 1951 to 1954 and the USTA ranked her as number one in the world in 1952 and 1953. Shortly after winning her third straight Wimbledon title, she suffered a career-ending injury from a horseback riding accident in July 1954. Connolly Brinker married 1952 Olympic equestrian team member Norman Brinker. After settling in Dallas, she remained involved in Tennis as a correspondent for various U.S. and British newspapers at major Tennis tournaments. In 1968, she founded the Maureen Connolly Brinker Tennis Foundation with the help of friend Nancy Jeffett, to promote Junior’s Tennis. In 1956, she was inducted into the Breitbard Hall of Fame, which honors San Diego’s greatest athletes, on and off the playing surface. She was inducted into the International Tennis Hall of Fame in 1968 and the International Women’s Sports Hall of Fame in 1987. In June 1969, she passed away of cancer at the age of 34. Connolly Brinker will be one of seven inductees honored at the Texas Sports Hall of Fame banquet on March 30. She will be joined by the family of former Houston Texans legend Andre Johnson, former University of Arkansas legend Loyd Phillips, former professional basketball star Nancy Lieberman, former University of Texas and MLB pitcher Greg Swindell, former Texas A&M and NFL kicker Tony Franklin and former Dallas Cowboys All-Pro Tight End Jason Witten.